A child points to the Pythagorean theorem, also drawn on the stone wall. Mathematics is shown to be the 'ground of existence'. Pythagoras was a 6th-century-BC Greek mathematician and philosopher who taught that numbers form the underlying basis of reality, an idea that began the ultimately successful effort of Science to separate spirit from matter. (Blake responds that "God is not a mathematic diagram.") This scientific child, and his alter ego, are grounded in ratiocination and materialism and thus lack spirit and imagination (only their left feet touch the ground). The child has twin aspects, one dark and wild, the other light and groomed, representing the dual Gemini mind being schooled in the pagan and natural sciences. Embodying the spirit of learning, the children seek truth and openly communicate what they discover. The outdoor environment, with its various representations of nature, indicates that the phenomenal world is the subject of their speculations. The William Blake Tarot explores the mystical vision and artistry of the renowned English painter and poet. Through rich interpretations focused on creative undertakings, it has long been the deck of choice for artists, writers, musicians, and thinkers. 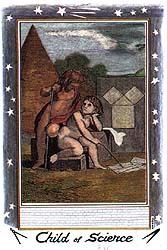 For more information about this deck, or to buy your own personal copy, go to www.blaketarot.com.